1. The character Nin, means to guard the nation with one’s life. Many people talk about Mushin. What is it? How do I practice in Mushin? Will it help my training and fighting ability? There are so many questions on Mushin that I decided to discuss a few points and why it is so important in training. Mushin, literally translates as “no mind”. Sometimes, the term “no thought” is more appropriate. When dealing with an action an opponent or otherwise, you just deal with what is. Not what could happen, will happen or any other thing, only “what is”. (I have borrowed the “what is” from Larry Renosa, a senior student of Steven Seagal) Many of us have had the following happen; you are driving to work, you stop at the lights, listen to the radio, avoid that pedestrian, and all of a sudden you have arrived at work. Hopefully you were not sleeping but in a state of dealing with “what is” or mushin. Zen is living in the moment fully. 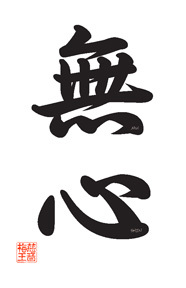 Mushin is Zen applied to conflict. Many make some deep mystical philosophy out of the idea of mushin. In my studies of ancient warriors, and philosophies I have come across a common theme. One must train diligently in a calm and relaxed manner, allowing the mind not to rest on any one particular technique or theory. For when it does your opponent has seized the moment and won the battle. A few styles of traditional martial arts, offer a unique training method known as randori. Randori is a free flowing drill where opponents take turns attacking an individual in a predescribed manner. Later, at more advanced levels the opponent comes at you with many attacks in a never ending stream. Randori allows us to leave kata and inot instantaneous intuitive, creative decision making of an infinite variety of techniques. The ability to stand in the middle of a group of attackers and then deal with each of them efficiently is no easy task. Morihei Ueshiba, was famous for his randori, and it has been popularized by the practice of Aikido. 1) Relax and feed your opponent in a constant manner. 2) Take your ukemi and move off the training area. 3) Always try to return to the middle of the mat to execute techniques. 4) Breathe in a constant rhythmic manner, allowing your awareness to expand. Through randori, you may start to glimpse mushin. You will find it happening gradually. More and more, then just when you think you have obtained it, it is gone. Don’t grasp, just reach and you will obtain it. This entry was posted in Uncategorized on June 1, 2012 by admin.